Wanna be an artist? This tutorial for Nintendo’s adorable yellow Pokémon can definitely help. 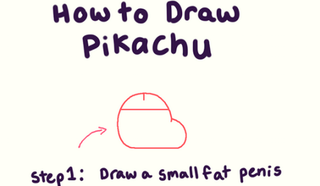 As artist paperbeatscissors pointed out on Twitter this morning, drawing your own Pikachu can be accomplished by simply sketching penises over and over. It’s a simple, five-step process. Not sure you’re going to convince the Internet to stop drawing penises, but it’s a nice gesture.